Stuff the kids can see—your resource for family movie night. 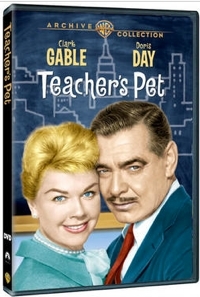 If you believe that a steady diet of contemporary films ought to be supplemented occasionally by an interesting foreign film or black-and-white classic in order for the kids to have a broad sense of culture, you might consider Teacher’s Pet for a family night movie. Along with Pillow Talk it’s one of Doris Day’s most delightful and enduring romantic comedies, and the kids get a two-for, since she’s paired with pop culture icon Clark Gable. Yes, eyes will roll as Day sings the cheesy (albeit catchy) title sequence song, but in the first scene the Internet generation gets an introduction to old-school newspaper production. We watch a group touring the New York Evening Post and see what they see: presses rolling and the chaotic excitement of the newsroom. The film’s theme is introduced in this early sequence when a mother who had snuck onto the tour begs city desk editor James Gannon (Gable) to fire her son so he’ll go back to school. Gannon, who never went to high school, is convinced that real job experience is more worthwhile than college. I thought of old Sam as I watched the animated Justin and the Knights of Valor, which, as I told my wife, had its moments. Unfortunately, that included a moment when a horse started behaving like a dog and it reminded me of Disney’s Tangled, or the main character was blindfolded as he learned how to become a knight and I thought of Luke Skywalker, or the same lad set astride a crocodile with mechanical wings strapped to him gave me How to Train Your Dragon flashbacks, while a swordfight by a giant wheel had a Pirates of the Caribbean look and feel. And so on. 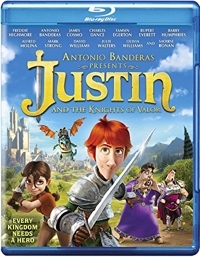 In this new age of computer animation, films like Justin and the Knights of Valor prove that you don’t have to have the resources of a Disney or Pixar to create great graphics with a superior production design and accomplished animation. But those high-quality production values also got me thinking about the difference between films like this one from KANDOR Graphics (Spain) and mega-budget studios. Father Goose is one of those rare films that appeal not only to lovers of the genre—in this case, romantic comedy—but others as well. There’s humor and WWII adventure in this amiable 1964 film, which will appeal to boys in the family. The girls, meanwhile, will be won over by the seven schoolgirls of varying ages that are rescued by a reluctant (and still very funny and attractive in his second-to-last film) Cary Grant. Grant plays teacher-turned-beachcomber Walter Eckland, who dropped out of the world and in return just wants the world to leave him alone. Though war in the Pacific is raging all around him, he’s determined to be neutral and uninvolved. We first meet him when he turns up at British-Australian naval base that’s under fire, and, bothered more by a pelican that keeps hitching a ride on the boat he recently bought than by shells exploding nearby, he proceeds to try to “borrow” cans of gasoline and rations. That plays right into the hands of the dockmaster, an old friend named Houghton (Trevor Howard) who’s been ordered to evacuate and set up shop coordinating more than 30 coast watchers spread across the Pacific islands. He needs one more coast watcher and Walter needs supplies, so they strike a deal . . . which Walter had no intention of abiding by, until Houghton “accidentally” rams his boat and forces him to make for the island. Then, to get Walter to actually report Japanese airplane and ship movements, Houghton hides bottles of scotch whiskey and gives Walter the directions to a bottle for every confirmed sighting. Walter never gets drunk, and his drinking is played for laughs, so most parents won’t find it objectionable. After all, there is a war on, and when Walter ends up rescuing a pretty young teacher (Leslie Caron) and her charges, she immediately sets about trying to reform him. He may be gruff, but he’s still a likable fellow that the girls find as appealing as their teacher does. Sparks eventually fly, and the action intensifies, and in no time at all you’re rooting for this pair of opposites to come together in spite of all that’s happening in the world around them. It’s one of the better Cary Grant films to introduce children to, and a darned good “starter” romantic comedy because of all the other distractions. Don’t expect a laugh-out-loud comedy—just a lot of smiles, and a little tension, too, as the world threatens to tear this couple apart before they can even come together. It’s a fun, light adventure that’s perfect for family movie night. I’m sure you’ve heard people say, as I have, that they were “ruined” somehow by the relentlessly chipper, happily-ever-after romanticism they absorbed during a steady childhood diet of Disney cartoons and animated features. Well, there’s a cure for that. Start with a dose of irreverent Warner Bros. classic cartoons, and then be sure to watch occasional animated features from different countries, where you’ll discover a world that’s not so black and white, morally speaking. 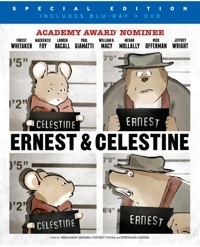 That’s certainly the case with Ernest & Celestine, which received a 2014 Oscar nomination for Best Animated Feature Film of the Year. Ninety-eight out of 100 critics at Rotten Tomatoes pronounced it “fresh,” and Ernest & Celestine won a number of prizes, including Best Picture at Amsterdam Cinekid Festival, Prix SACD Special Mention at the Cannes Film Festival, Best Animated Film at the César Awards, People’s Choice Award at the Dubai International Film Festival, and Best Film (the first animated feature to win) at the Magritte Awards. In other words, people loved this film.